Where did the name “K-Max” come from? It was a progression. At first I went with “Verve,” because Verve [Records] had a lot of jazz records out, and they’re still a jazz label. “Verve” actually [means] having a very vivacious and living sound or feel to your music, which was kind of fitting. So I used “Verve,” but that turned out to be kind of disastrous, because people don’t listen correctly. When I’d be announcing at parties or even on fliers, people would call me “Verb,” like an action verb. Everyone was complaining and saying it wasn’t catchy. During my tenure working with record labels, people started calling me ‘K-Max’ instead of calling me Kevin Maxey, and that’s how it stood. I didn’t use it as a DJ name, people just started calling me that…people truncated it and put it together and it just started to work. I would say 2005 moving forward, it has been K-Max. I like who I am with K-Max. If someone says they know K-Max, the one here from Chicago and not the one in Oakland with two X’s, you’ll know you met me—because I happen to be unique enough that you know who the hell I am. You remember conversations, good or bad. What are the first memories you have of hip-hop? [My] first memory of hip-hop was in the early eighties—it was the song “White Lines” [by Grandmaster Flash]. My father took my brother and I to Fresh Fest [a music festival, now at Navy Pier, originally held at the University of Illinois at Chicago Pavilion]. Back then, it was all disco and pop. You had Prince and Michael Jackson. It’s what you heard on the radio. I had already heard “White Lines,” already heard Kurtis Blow—“The Breaks”—stuff that we didn’t know was hip-hop breaks. These are now classic breakdance records. Those are things I heard, I would say, around ‘82, ‘83. Is your father also into hip-hop? No, not really. Because at the time, the music was popular and that’s what was happening. By ‘85, ‘86, after The Fat Boys and all that started, the language changed. By the time it got to that level, my father was out of it on a consumer level! He wasn’t in it, unless the song was popular or it was on the radio. My father liked Whodini. I never really liked Whodini! People are going to be mad at me for this! I mean, I don’t always go by conventional. Is there an artist or anyone who you were specifically influenced by? I was influenced by a lot of people. There’s a lot of people I liked, but it wasn’t until the early nineties. By the nineties, you had everybody. In one end, you had N.W.A., all the way to The Pharcyde, and [then] you had Cypress Hill, A Tribe Called Quest, the whole Native Tongues movement. 1988 to ‘92 really is a golden era. That’s when you had so many people and so many different styles, and there was room for everybody to eat. You can go to a party and hear all these songs from that era together, and it be like, “I know that joint!” or “Oh yeah! This is cool!” At one point, I did want to rap, and I put this out because I tell everyone, I did used to rap. If nothing else, I felt like I was a decent writer and I could pin some stuff. But [this was] before I even knew what a ghostwriter was. Had I known, maybe I would have pursued that harder. Was hip-hop the first genre of music you liked? No. No, it’s not. It was soul. I can recall Minnie Riperton and “Loving You,” the album cover with the ice cream on it. And by the time I was playing it, I didn’t even know she had already passed away. My father was into a lot of records and a lot of it was Motown. Like, James Brown. It was things that were playing in the house that weren’t hip-hop. In fact, [with] “White Lines,” I don’t think my father ever bought that. I just remember it being real big on the radio. My father never bought a Fat Boys album. By the time they were beatboxing, I knew my father did not own any of that, and I had to get a cassette tape from my friend, and I got a dub. That’s something you haven’t heard in a while. What is it about hip-hop that you love so much? Well, something that I loved about hip-hop was that it was fresh. It was new. I liked the beats. I liked the rhymes and styles. I mean, I left out LL Cool J too, “My Radio.” It was all of that. If was just different from everything that was out. These guys couldn’t sing, these guys didn’t necessarily play instruments. They just rapped and I could remember the words. The beats! It was great. Even the sounds that they would use—and they looped it together and put some drums behind it, and that was just catchy. How long ago did you start DJing? I was doing it as a hobby, more of a cool thing. I mean, I would say since the early ‘90s. 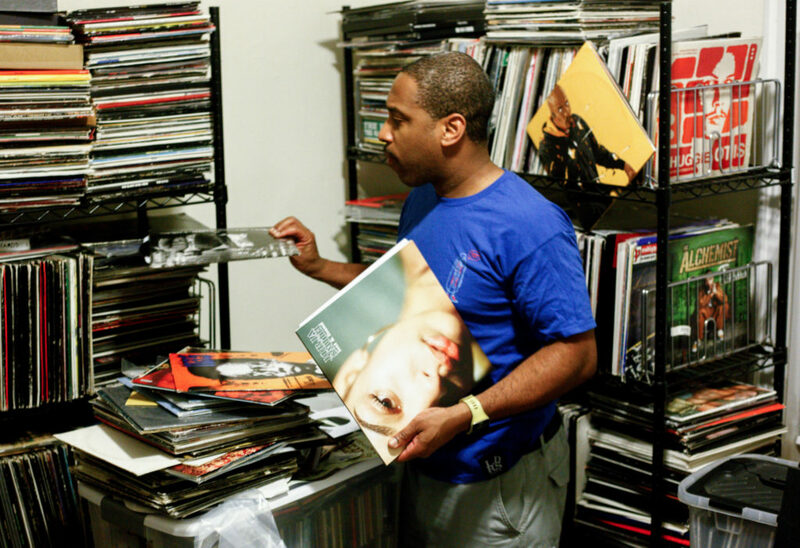 DJing… I have records. I have turntables. You got an amp? Speakers? I can do it. That was exciting to me. I mentioned the rapping earlier, but it was Jazzy Jeff, Terminator X, that kinda put the seed for me to want to DJ, ‘cause I thought that was cool. They were just juggling records. But even before that, there was Herbie Hancock, off the Future Shock album—“Rock It”—he scratched a record! That was just crazy! I tried to scratch my father’s records, but he had a belt drive—I didn’t know at the time that you needed a magnetic drive on your turntables, a real turntable. You can’t [scratch with] a belt drive or you’ll break the belts, they’ll snap! Not to mention, you need specially-designed needles for that. You can’t just use regular needles. There’s grooves in those records; you’ll rip the grooves up and kill it. How did you become a host for CTA Radio? While I was in Carbondale [at Southern Illinois University], it was WIDB Radio. That’s how I got my first hands on actual equipment. I was just there for a year, the year I was in Carbondale. From there, did you immediately start hosting at WHPK? While you were still at Carbondale? No, that was way later. I had a super long gap in between, like several years. Carbondale was Spring of ‘93. By the time I got there, I had already had a collection of records. So, when did CTA Radio start at WHPK? I would say I started filling in on Friday nights for JP [Chill] in ‘97, ‘98, 10pm to 3am. People don’t realize that when we first started CTA Radio, it was myself and Thaione Davis. We had to alternate Wednesdays, and then it was me and Pugs [Atomz]. We were competing on Wednesdays, and we figured that we were pretty much shooting ourselves in the foot, instead of just coming together. September 19, 1999 is when it was officially formed. What have been some of the most memorable moments you’ve had at the radio station? So many guests! We’ve had everyone from Mobb Deep to Arenda Troutman—if you’re not from Chicago, she was an alderman, and they pretty much busted in her door, like the Ice-T song, “6 ‘n The Mornin.” No really, it was like six in the morning, and she was in her pajamas and they had kicked in her door. All I know is that she had lost an election that year and was going around making deals. We’ve done interviews with Black Milk. Common and Kanye did a battle up at CTA in the early nineties. We had Vic Mensa and a lot of people who is poppin’ in Chicago. We used to have a lot of big freestyle sessions. We interviewed the original Slum Village. I didn’t get the chance to do J-Dilla. We’ve done a lot over the years. People always underestimate what we’ve done at CTA Radio. You have such a large vinyl collection! When did it get started? 1988. It’s been up and down because, of course, I would have way more—but unfortunately, [there were] some circumstances in ‘07, a criminal operation. In 2007, because of a miscommunication with the patriarch of my family—and just the criminal operation that they were running in that storage room—I lost more than $40,000 worth of records. Beware of storage rooms, ‘cause everyone ain’t up and up. They got on camera what you bring in, but a lot of these people scheme with storage room raiders. That’s why I’ll always make sure to have enough room for the records. Is there anything you’d like to say to your listeners? Tune in! Support. You have Clear Channel and all these corporate takeovers, and we just have one voice. Don’t take this for granted. We are out doing this, there is no compensation, there’s no money, there’s no check at the end of the show. We do this in all types of weather. We still out there doing the show. We fight to keep the show. I purchase a lot of my own music. All the vinyl records you see on the Instagram posts is from my own collection. Support and tune in, spread the word. I appreciate it. Tune into CTA Radio every Wednesday night from 9pm to midnight on whpk.org or on 88.5FM. Follow K-Max on Instagram at @chi_kmax. Wendy “Random” Chavez is a contributor to the Weekly and photographer and writer from Los Angeles who is currently living on the South Side of Chicago. Focusing on street cultures and creative platforms, she gives her full attention to a brand new environment where she allows herself to expand her documentary styled assignments. This is her first article for the Weekly.